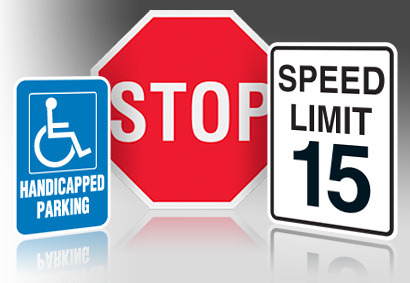 TRAFFIC SIGNS AND PARKING SIGNS - For Your Safety and Direction. Custom or Standard. Both Perma-Nylon and Koralex II material may be used for both indoor and outdoor use. This Heavyweight DuPont Nylon is the most versatile and longest lasting nylon flag fabric available. PERMA-NYLON'S combination of strength and brillant display, along with its quick-drying ability, make it suitable for a wide range of applications. Great in rainy areas, its light-weight and close weave enable it to fly in the slightest breeze, giving the fullest visual effect. Koralex represents new and improved flag fabric technology. Made of 100% spun polyester, its 2x2 ply construction combnines durability, strength and flyability with a rich feel and look. These flags are ideal for extreme weather conditions without the excess weight. Ideal for high wind areas and for daily flying. If you have any further questions or would like to order any flags, please contact thesignstudio@sbcglobal.net or give us a call at (818) 843-9200.
costly means of advertising available to you over time. business to a potential customer who frequents the area where your business is located. If a sign costs you money it is not doing its job. It should effectively advertise your company and earn you money. Good signs incorporate design and marketing decisions creating the message, look, colors, sign types, sizes, quantities, etc. to create the required impact. business 15%. A Whataburger that was unhappy with their new store’s volume removed their brand-new pylon sign and installed one 40% larger and taller. The store’s volume immediately increased 23%. Again quoting Small Business Administration research, 89% of businesses that fail do so because of improper signage! Stated differently, good signage gives a business an almost 90% probability of success. The SBA says that an LED Message Center increases store volume 15 - 150%. Purchasing the right signs for the job helps a business survive by bringing higher returns. lighted when it is dark out, including on dark days when everyone else's sign is lighted. With 18.6% of the entire US population moving each year, your sign will be constantly seen by MANY potentially new customers. impression of your business as your sign ages. If you have any questions or need any help with your signage needs, please contact us at thesignstudio@sbcglobal.net or (818) 843-9200.